When most people buy a new bike, they jump on it and ride it until they are sick to death of the thing. Not me. Other than a five-mile spin around the neighborhood, I kept my new Surly Cross Check on ice for two weeks. I was waiting for a saddle bag to arrive before going for a longer ride. I put the bag on my bike. I think it looks great. My bike is black with white decals. The Barley is black with white leather straps. It’s a bit small for my needs so I have ordered a Carradice Nelson Longflap bag. The Barley will go on The Mule. A digression about Carradice products: I have two Carradice knock offs made by a company called Zimbale. They look nice but they are starting to fray from very light use. I noticed that at the very point of fraying the Carradice has a leather tab that reinforces the canvas on the bag. Long story short, you get what you pay for. The Cross Check on the left. The Mule on the right. Before I headed out, I measured the seat height on the Cross Check and compared it to the seat height on The Mule. Based on this, I adjusted the Cross Check’s saddle down about 1/2 and inch. Bad idea. Anytime you ride a new bike, you should not go overboard. You’re body will freak out from the subtle differences between the new bike and the bikes you are used to. After five miles of smooth riding, I decied to ride to Fort Washington, part of the defenses of Washington in the early 19th century. The route took me across the Potomac River on the Woodrow Wilson Bridge (I-95). There are some ugly explansion joints that gave me a jolt. They give me a jolt on all my bikes so I am not complaining. On the Maryland side of the bridge, there is a cool spiral ramp to take you down towards National Harbor. I was hoping to let the Cross Check rip here but it was packed with about 20 walkers. After that, I rode up Oxon Hill, a long slow grind. It took a while to find a rhythm but once I did the Cross Check carried me up hill nicely. I took a right on Oxon Hill Road and found myself on fresh asphalt. Maryland’s Department of Transportation (MDOT) did a nice job on this new road, throwing in a couple of roudabouts in the deal. 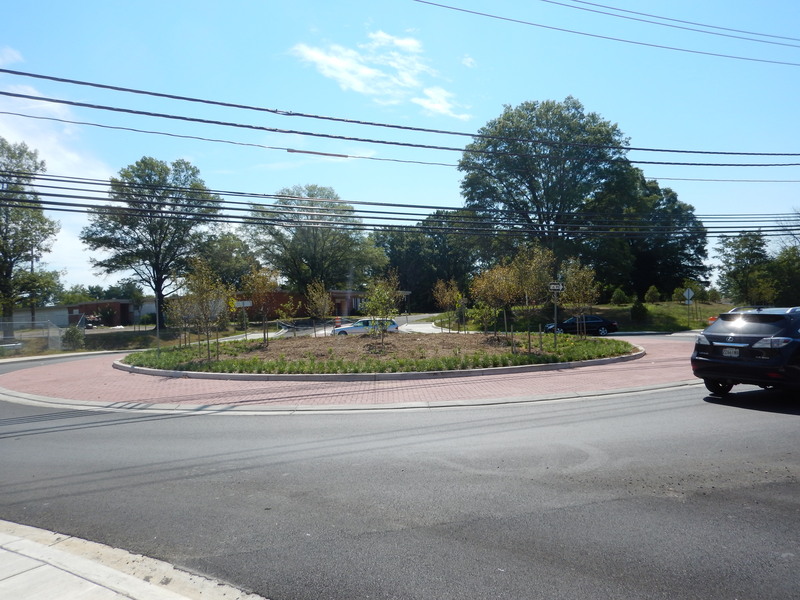 The Cross Check loves roundabouts. So much fun. I jumped off Oxon Hill Road in favor of the less trafficky Fort Foote Rd. This road cuts through a suburban, residential neighborgood before it loops back to Oxon HIll Road. This section of Oxon Hill Road needs some work. I zoomed down a hill, rolling right over all kinds of asphalt patches. Smooth as silk. I banged a right on Livingston Road and another on Fort Washington Road. Soon I was digging out my annial pass to federal parks. I rolled through the park and eventually walked my bike into the fort. It’s pretty awesome. Tall brick walls protected by a dry moat. I stood next to where the old gun emplacements were. After hanging out I headed for home, retracing my route, but skipping Fort Foote Road. Also, I stopped at St John’s church, built in colonial times. There is one big hill on Oxon Hill Road that I wanted to try. Let’s just say, my pathetic ascending skills are not about the bike. The down hill back to the Wilson Bridge was quite a lot of fun. I was cruising at 33 miles per hour. The bike was on rail. Weee! After about 30 miles my lower back and neck were starting to complain so I headed home. I will probably need to tweak my saddle position a bit but for a first ride, this one was pretty darn comfy. For some pictures of my excursion, check my Flickr page. I have yet to name my bike. I have some pretty strong contenders though. I wouldn’t want to rush into things. The weather gods gave us some nearly springlike temperatures today. And no howling winds either. It was the real deal. 50+ degrees and sun. On a whim I headed over the Woodrow Wilson Bridge to Maryland. The trail was crowded with walkers making their way toward Alexandria. The best part of the bridge is the spiral ramp on the Maryland side. Riding this on a recumbent induces glee. I rode home on the Mount Vernon Trail slaloming through the walkers, runners and cyclists. I was so focused on not hitting anyone that I completely didn’t see my friend Judy who called out to me as I rode by. 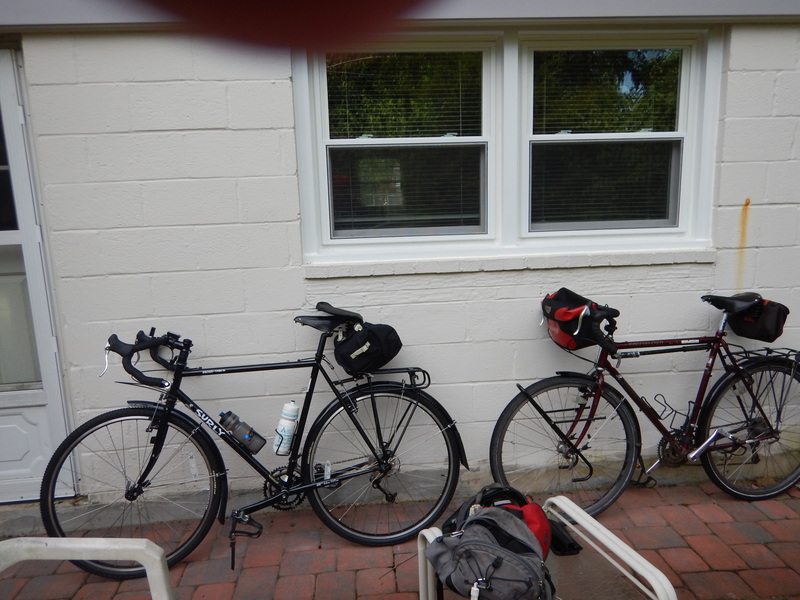 I finished the ride with a trip to the hardware store for birdseed and a padlock. On the way home from the hardware store I rode with my jacket zipped open. It felt like 60 degrees. I fear the weather gods are setting us up for a fall. 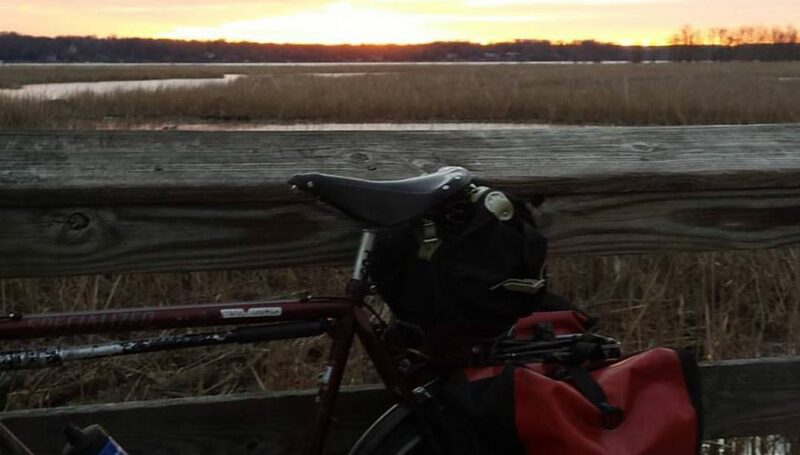 Today was the day for the Southern Maryland 100 bike ride. The ride begins and ends in Indian Head Maryland. There’s not much there but a navy installation. I’ve done the metric century (100 kilometers) several times before. It’s a lovely place to ride and only about 40 minutes from my house by car. I rode Big Nellie today. The weather was as good as it could be for bike riding. I took a cue sheet but I didn’t need it. I just followed the green arrows on the road. This ride is put on by the Oxon Hill Cycling Club. They do a wonderful job of staffing the rest stops with interesting food. The first stop had English muffin sandwiches with ham, eggs and salsa. Also, peanut butter sammiches! The next stop had enthusiastic junior high (or maybe high school) kids cheering us as we rode in. Their special treat was tomato and mayo sammiches. I couldn’t resist. The last rest stop had cherry slushies and veggie sticks (sort of like potato sticks but more better). 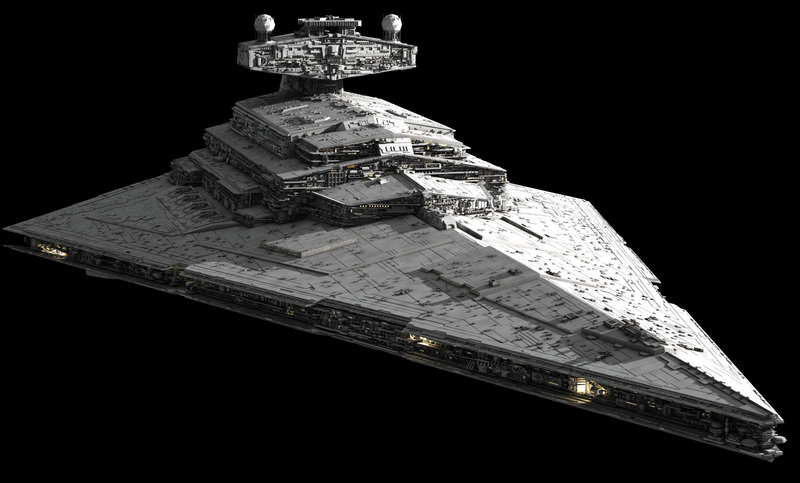 The terrain is not very difficult. Oh, there are maybe 10 hills to climb but none of them harder than the Park Terrace hill near my home. 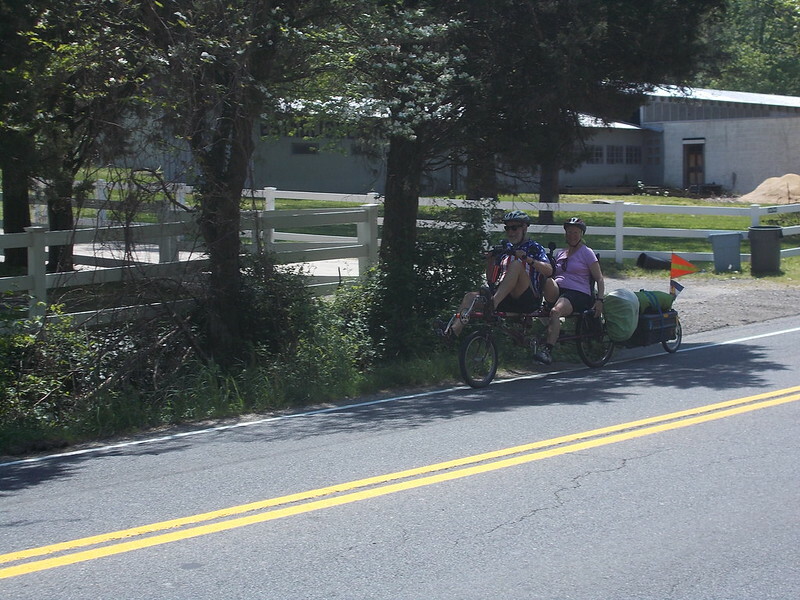 Of course, on a recumbent, you get passed by lots of roadies going up. Going down is another story; I hit 37 miles per hour on one downhill and reached the mid-30s on the rest. Too bad I didn’t have my fairing on. The riders were very respectful of each other. The lycra pacelines announced their passes and gave me plenty of room. This is not the case at Backroads (my only complaint about a ride that I love). People said “Good morning” as they passed or chatted about how nice a day it was. I needed to get back home to take care of a few things so I didn’t socialize or hang out at the rest areas. The last big hill is called Rose Hill. Even the roadies were flagging on this one. I had stayed out of my granny gear all day, but I dropped into it on Rose Hill. I was surprised at how good my legs felt near the top. I down shifted and passed a bunch of wedgie (that’s recumbent speak for a conventional bike) riders just before the top of the hill. After 33,998 miles, I’m starting to get the hang of this recumbent thing. I had plenty left in the tank when I got to the finish. I could easily have ridden the century. I am downloading the cue sheet for the 100 mile ride for future use. When I got back to my car, my rear window had been defaced, or besmirched, or disrespected. My kids attended the Maret School for high school. 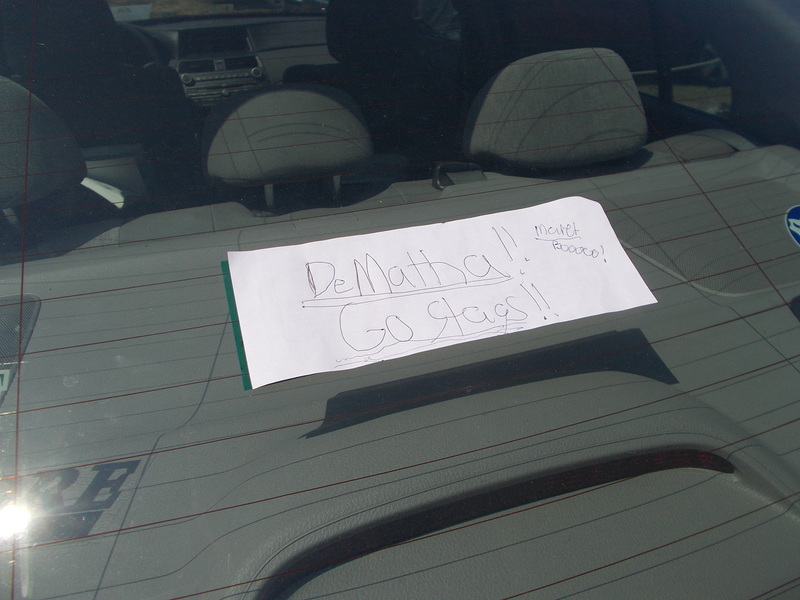 I have a Maret sticker on my back window, but it was covered with a sign from a Dematha person. In nature, stags crush frogs, but in DC, FROGS RULE.